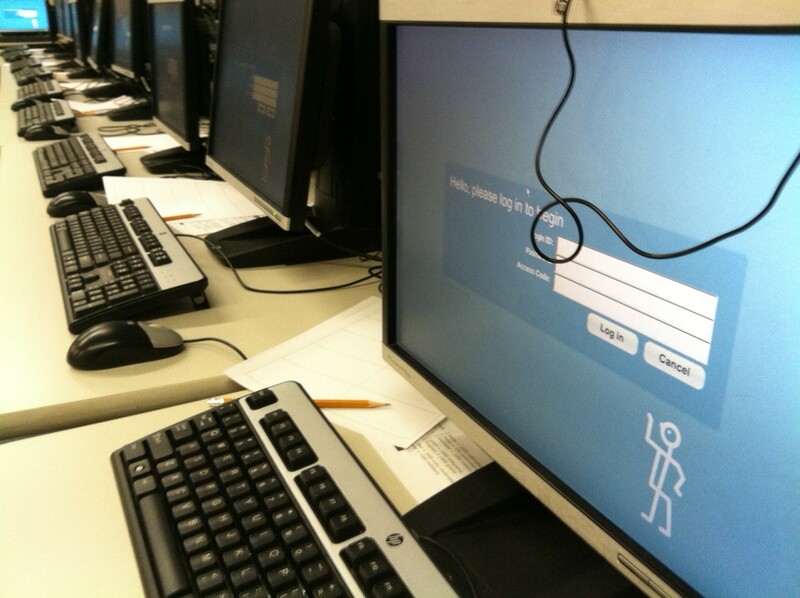 A login screen on a computer in an area set up for online ISTEP+ testing at Tecumseh Junior High School in Lafayette. The team charged with setting up online testing worries Monday's glitches could slow down students taking exams on Tuesday. UPDATED, May 8 — We’ve attached to this post an audio story we sent to Indiana public radio stations on May 7. For our most recent posts about the ISTEP+ disruptions, click here. During the ramp-up to the administration of ISTEP+ exams to the 1,000 students at Tecumseh Junior High over the next week or so, school media specialist Dave Hobbs takes on another job title: logistics officer. Hobbs and a team of several other staff members spent the better part of Monday preparing the 250 computers students will use to take the exam. 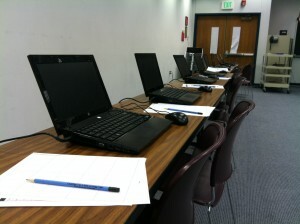 To ensure test administration runs smoothly starting Tuesday, Hobbs has to plan down to the minute, taking “hours upon hours upon hours” to open computers to the login screen where students launch their tests. But “the big worry right now — the tech people have already warned me — is that CTB had so many problems today, they’re more than likely going to be rebooting their servers tonight, which means all this work that I’ve done for the last several hours will be for nothing,” Hobbs says Monday afternoon. “All these machines will have to be logged in tomorrow morning,” a process that takes three to four minutes per computer. Online testing, says principal Brett Gruetzmacher, does allow schools to access near-immediate exam results. But paper-and-pencil testing can be done over two days, not a week. Indeed, Monday’s glitches on statewide ISTEP+ testing aside, Gruetzmacher says the logistics of administering online exams can be daunting. Laptops set up with pencils and scratch paper at the ready in a temporary testing lab at Tecumseh Junior High in Lafayette. School principal Brett Gruetzmacher says his school needs to set up temporary testing spaces to accommodate the number of test-takers they have this year. And the preparations don’t end with getting computers to login screens. Gruetzmacher shows off a temporary testing lab created by spreading out mobile laptops in a giant meeting room. Infrastructure has been updated to accommodate the online ISTEP+, too. The Lafayette Community Schools spent money adding more internet connections throughout the school, Gruetzmacher says. Tecumseh will also go wireless next year. 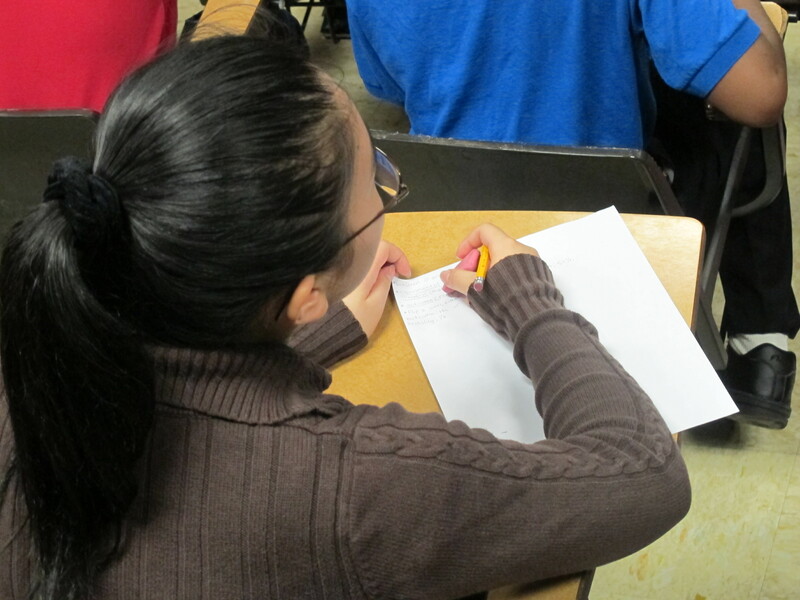 ‘Teaching To The Test’: A Problem Worth Fixing? Or Not A Problem At All? How Does ISTEP+ Actually Work? Representatives from the Indiana Department of Education and the testing company that oversees ISTEP+ testing, CTB/McGraw Hill, tell StateImpact CTB engineers are working through issues on their servers and that testing can go back to normal on Tuesday. But Monday’s issues with online testing aren’t new. Spokespeople for both the Brownsburg Community Schools and Fort Wayne Community Schools referred to similar glitches in online testing when the state first made online exams available two years ago. “I’ll bet there were a lot of schools like us that stayed away from Monday. I think tomorrow will be a pretty heavy day,” Gruetzmacher says. UPDATE, May 8: Gruetzmacher says Hobbs found all of the computers he spent Monday setting up for testing ready to go on the morning of Tuesday, April 30. After three successful periods of testing, Gruetzmacher says the fourth group of test-takers at Tecumseh was unable to log in to the exam website. That’s when, he says, the Lafayette Community Schools decided to suspend testing. Find our most recent posts on the ISTEP+ disruptions here.